United Nations (United States) (AFP) - Pope Francis on Friday began a closely watched visit to the United Nations, where he will deliver a wide-ranging speech at the start of a full day in the Big Apple ending with a mass at Madison Square Garden. 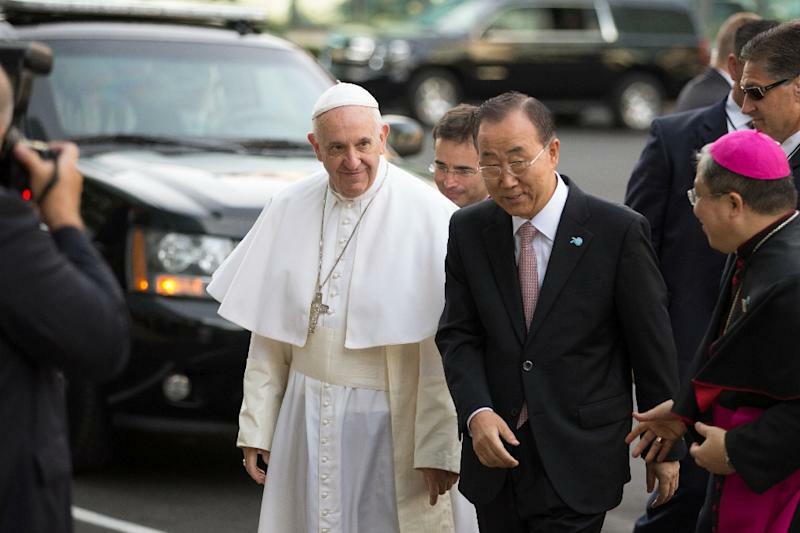 The leader of the world's more than one billion Roman Catholics arrived at the UN headquarters on New York's East River where he was welcomed by Secretary-General Ban Ki-moon and dozens of waving children. Francis, paying the fifth visit by a pope to the global body, will speak later Friday as the United Nations holds a summit on development. The pontiff urged UN staff to pray for him. Francis, who has built a wide global following for his reform-minded views, is on a visit to the United States and earlier enjoyed a rousing reception in Washington. Later in New York, he will visit Ground Zero and greet crowds in Central Park before the evening mass.